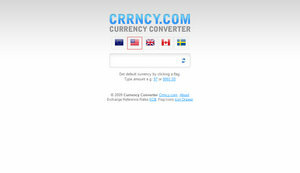 Crrncy or Currency Converter is a fast and simple service for your currency conversion needs. To use to service simply select the flag of the default currency and enter the amount you want to convert. The results are displayed on the same page and contain conversions of all the supported currencies, which are currently limited to USD, EUR, GBP, CAD and SEK, with more to be added soon. The service can also be used right from your browser’s address bar by simply entering the site’s URL followed by the value you want to convert as shown in this example http://www.crrncy.com/100.50. In case you need to change the default currency this can be easily done as so http://gbp.crrncy.com/100.50. Crrncy is the creation of Erik Martinsson.